For a crisp and sweet autumn flavor, try the Caramel Apple flavored coffee. With a creamy caramel flavoring to a slightly tart apple bite, this 100% Arabica bean gourmet flavored coffee features a succulent flavor that is just as delicious as a real caramel apple. 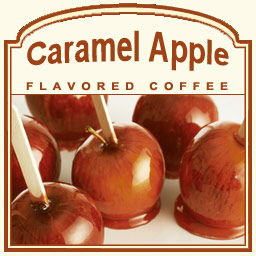 Each cup of this unique Caramel Apple creation has 2 calories, which will leave your taste buds wanting more and more. A heat-sealed valve bag will ensure the freshest coffee possible, which is why this Caramel Apple flavored coffee will be roasted and shipped on the same day. Reminiscent of candied apples, you will fall head-over-heels for this balance of caramel sweetness and juicy fruitiness.